Preheat the oven at 375°F. Cover with aluminum foil in a cookie baking dish. Place the salmon in the middle of the dish. Season with salt and pepper to taste. Mix the garlic, honey, lemon juice and olive oil in a small bowl. Mix well until the honey has dissolved. Bathe the salmon evenly with this mixture. Place the oregano sprigs over the salmon. 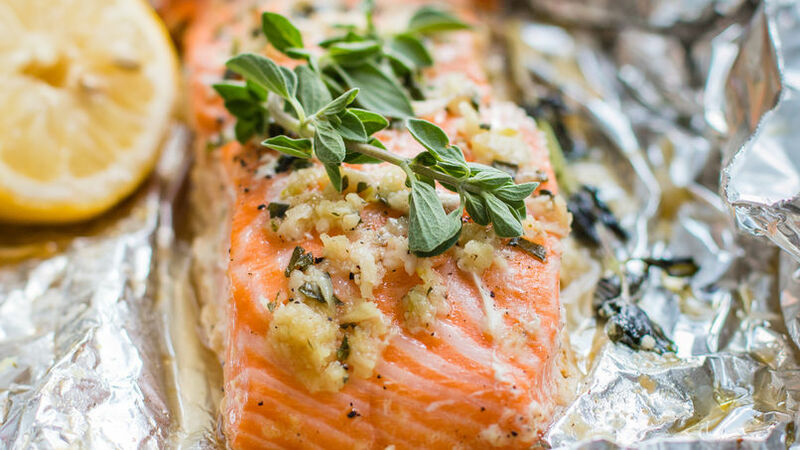 Fold both sides of the aluminum foil over to completely cover the salmon, creating a kind of envelope. Bake for 15-20 minutes or until the salmon has cooked. You can use other varieties of fish, if you prefer. Oriana Romero This salmon recipe is the perfect quick, delicious and simple meal! The sweet taste of the honey paired with the touch of acidity from the lemon make the perfect combination. You only need a few ingredients that you probably already have at your disposal. Serve this salmon with mashed potatoes or rice and a green salad, if you like.